Tired of taking cold showers? Call T.Webber today for prompt, professional water heater solutions. Our team of Plumbing & Heating Experts service, repair and install a full range of water heating equipment including: traditional tank water heaters, indirect water heaters and state-of-art “instantly hot” tankless water heaters. For over 30 years, we have been helping Hudson Valley residents live in comfort and safety. No Hot Water? Leaky Water Heater? Let us help. Whether your water heater is leaking or just not producing an adequate hot water supply, we can help. 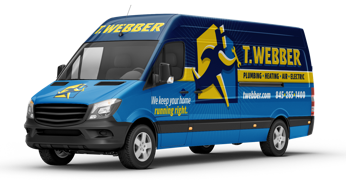 Every T.Webber service call begins with a thorough evaluation of your plumbing & heating system to pinpoint the exact cause of your troubles and identify any contributing factors. Once the root cause of the issue has been determined, our Plumbing & Heating Experts will present you with their findings, as well as any recommended corrective actions. With your approval, most hot water heater repairs and replacements can be completed during the same visit – restoring your hot water supply and your sanity. When repair is not possible or in a homeowner’s best interest, T.Webber can also offer same-day water heater installation services. Our team may recommend various water heater options depending on the size of the home, number of occupants and hot water needs. Once a hot water heater solution has been decided upon, T.Webber can remove and dispose of your existing heater, and install a brand new system in the same day. Fully licensed and insured throughout the Hudson Valley, all of our installations are completed to NYS code or better, utilizing the highest quality contractor grade materials and equipment and are backed by our one-year worry free guarantee. Are you happy with your water heater’s performance? If not, call T.Webber, your local Hudson Valley water heater repair experts. Our staff is standing by to serve you.